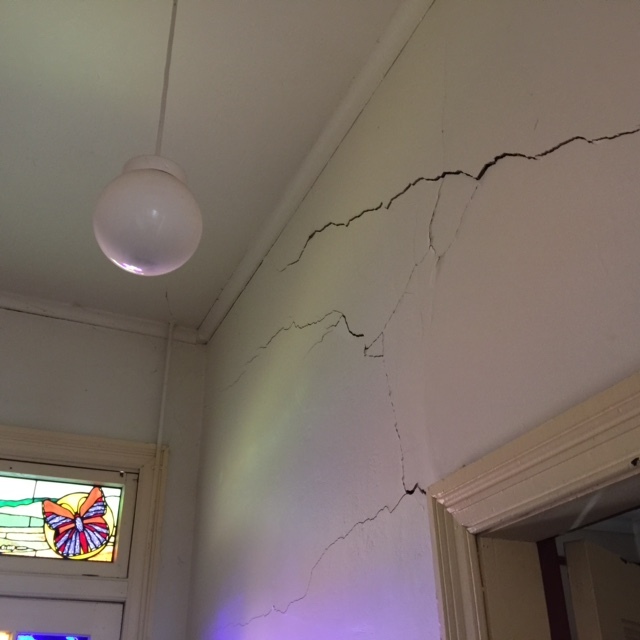 Yesterday a friend of ours, Chris Marshall, turned up at the house to talk about the Peel Common and noticed the giant cracks in the wall. 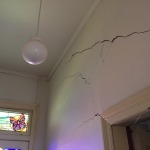 He is a soil and geology man, so the discussion about Bathurst’s clay soils, and how they make houses crack as they expand and contract, went deeper than the usual discussions on this topic. The usual discussions go like this, “Oh hell, lo ok at that giant crack in the wall.” And the reply: “Oh yes, Bathurst is built on clay soils that expand and contract in times of rain and drought.” But with Chris Marshall, it goes like this: “Our Pleistocene-aged sands and gravels are topped by Holocene-aged swampy meadows with dark coloured clay loam soils.” Actually I’m paraphrasing here from a paper he has just written as part of the Cox’s Road Dreaming Project. I was getting ready to scoot out of the house to perform Invisible Body at the Bathurst entertainment centre. But I really wanted to stick around for geological time. I wanted to be in a discussion that had absolutely nothing to do with me. This weekend, I’m a little over talking about me. I’m sure I’ll get interested again shortly, but for now, I’d rather be thinking about the Holocene period and swampy meadows and dark coloured clay loam soils. But there’s one more thing I have to do as part of my contribution to the Bathurst outpost of the Sydney Writers’ Festival: be on a panel titled “The Joy of Blogging”. It’s at 4pm in the Wattle Foyer in the BMEC today, if anyone in the neighbourhood is reading this and wants to come on down (the panel will include fellow local bloggers Marg Hogan and Cherie Quade. I know I’ll rise to the occasion and even enjoy it (as I finally began to enjoy the performance of Invisible Body) but right now, at this minute, I’m longing to get on to the not-me parts of the universe. Actually, just on the cracks in the wall: When my two little nephews and their friend were visiting, I told them the crack in the hall was a crack in the space-time continuum. They looked slightly alarmed so I said, “Only joking!” But I shouldn’t have been such a wimp. I should have let myself do their heads in. Kids get it too easy these days. PS: The performance went really well – people loved it. Kudos to director Fiona Green who managed to wrangle two slightly difficult, nervous, non-actors into a piece that really worked on stage. This entry was posted in Bathurst, family, theatre and tagged Invisible Body on May 24, 2015 by Tracy. You could borrow a sonic screwdriver from the good Doctor….